In the movie-making industry, many films originate from another source material or form of inspiration and, as such, intellectual property (IP) law will become involved. When a film is based on a book or screenplay or other creative piece that has been created by someone else, those producing the film must have an option, which is an agreement that allows them to temporarily have the exclusive rights to the creative piece. Option agreements are used for screenplays and are signed between the producers and the screenwriter. However, if the screenplay is based on another previously published novel or source material, the producer must also have the option for said material in order for the film production to move forward. An option should make it clear the exclusive rights that are being handed to the producers, the time period of the option, and what the original owner should expect to receive as compensation. A screenwriter must ensure, with the help of an attorney, that they know their relevant IP rights and how they will be paid. Sometimes compensation may not be upfront but depend on future revenue. All possibilities should be discussed. Once the screenplay has been optioned to a producer, the producer or studio must then find adequate funding, approval, and assemble the other necessary members for the project (like a director). The producer can pursue this for as long as they have the option. Therefore, a very long time can pass before the screenwriter receives any compensation for having optioned their screenplay, especially if the project is not greenlit. Once the option agreement expires (based on the period set in the option), the screenwriter (or owner of the work) will once again have the exclusive rights to the screenplay/piece – unless further rights are granted to the studio if the project is pursued. 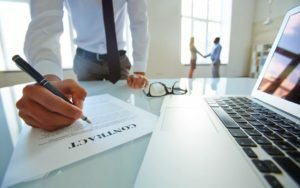 Since many important IP rights are involved, as well as the reputation of the work and screenwriter, before signing an option, ensure you have consulted with an experienced attorney.